Thanks for your donation to Implosion Group Publishing.. 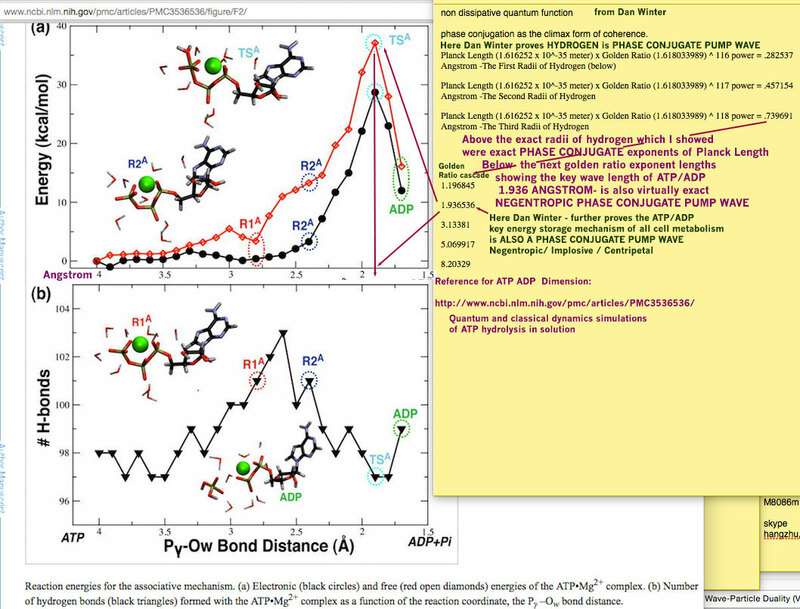 This clear line shows how the new DAN WINTER EQUATION: INTEGER (perfect phase conjugation) exponents of Golden Ratio x Planck length/time- stunningly predict: -3 hydrogen radii, -ADP(ATP)bond length, -exact 2 frequencies of photosynthesis, - ‘sacred’ English foot, - virtually exact frequency series of the Earth’s Schumann resonance harmonics – AND the human EEG brainwave frequencies of bliss/peak perception, - the MAYER wave and the HRV peaks LF and HF, -the Earth year, -the Venus year, -Precession, and the Galactic year! Note: Dan Winter / Implosion Group blog/current updates have migrated to facebook.com/fractalfield - Join us there- we're having fun! 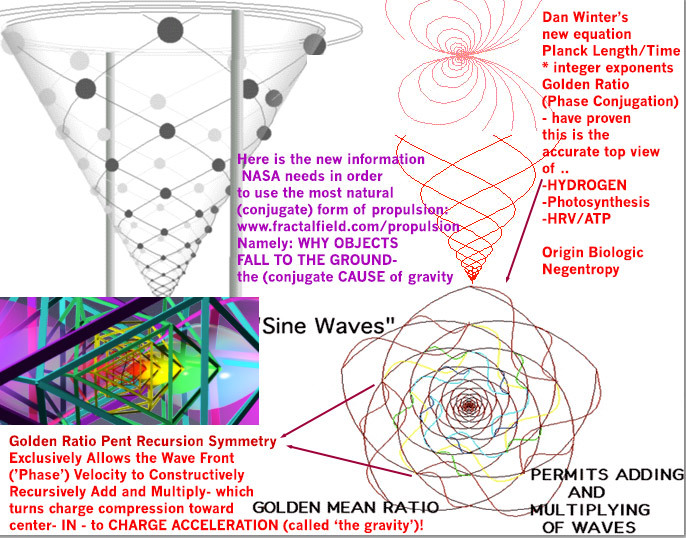 Known AFTER Dan Winter's new book: that ALL of the Golden Ratio (phase conjugate) wave mechanics (especially as Winter proved is the case for hydrogen) central to stable gravity is SPECIFICALLY golden ratio spacing to planck length and time. 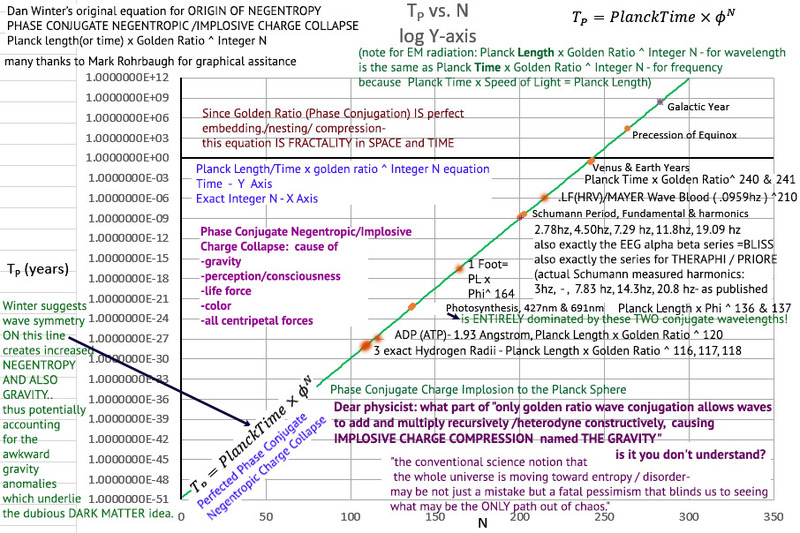 - is phase conjugate golden ratio charge collapse/implosion to zero point vacuum. Planck is that key signature. 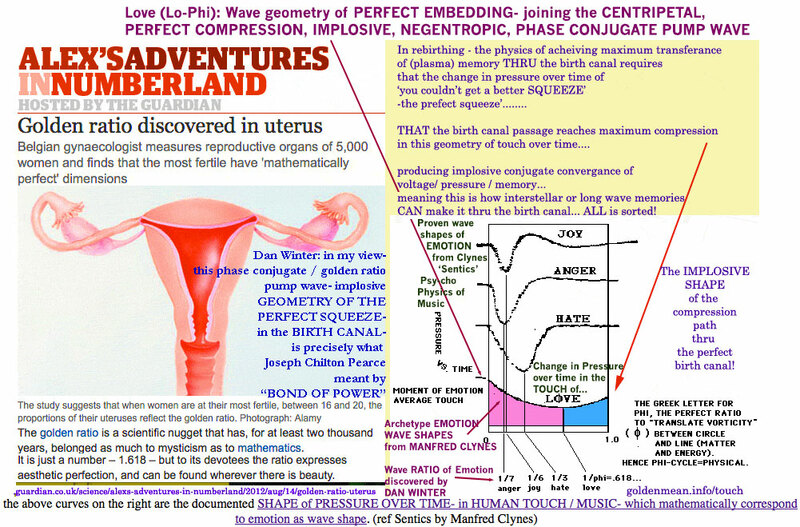 Mathematics proves: the wave shape of LOVE- IS a PHASE CONJUGATE PUMP WAVE! Implosive, Perfect Embedding, Negentropic and PHASE CONJUGATE- by Measurement! 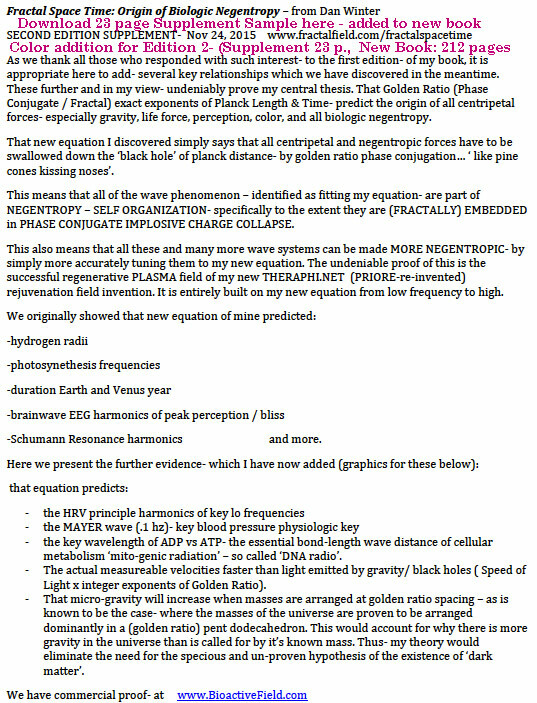 Is ALSO A NEGENTROPIC PHASE CONJUGATE PUMP WAVE- directly- to Planck/and Hydrogen dimension! Winter’s work (with his mathematics team- including Martin Jones)- was the first to prove the wave equations showing golden ratio solves the problem of max constructive interference, compression, and phase conjugation. SO phase conjugation – well known and proven in optics for time reversal, self organization and negentropy- now becomes a candidate for proving negentropy in general (many physicists agree that the gravity is itself negetropic / self organizing). Originally- just Dan's theory – that golden ratio phase conjugate multiples of planck length and time – the universal key signature of the vacuum- would optimize negentropy. Winter has now gone on to prove it. He was famous for proving that hydrogen radii are exact golden ratio phase conjugate multiples of Planck. 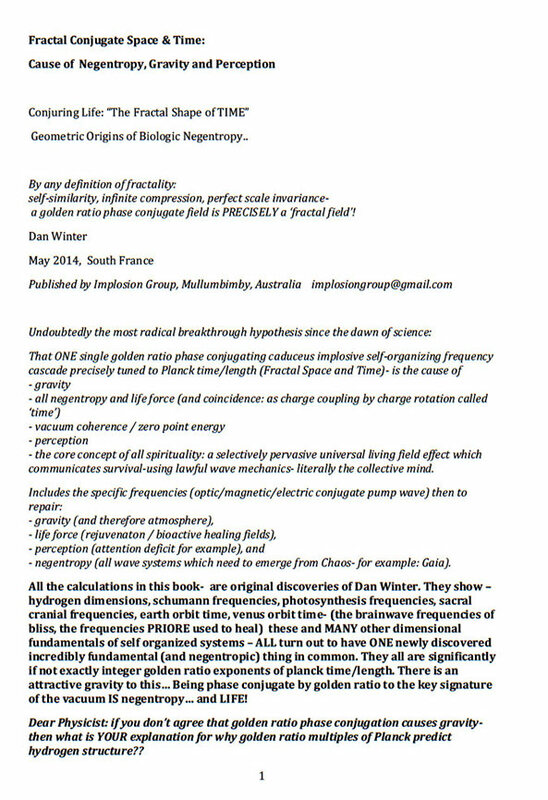 In his new book Winter has assembled with equation graphics results overwhelming further evidence- that golden ratio exact multiples of planck predict: * photosynthesis frequencies, * schumann resonance frequencies, * brainwave frequencies causing peak perception/ bliss, *(new) table showing the sacral cranial tidal frequencies are phase conjugate , * new table showing the ear ringing ‘sound current’ frequencies heard by meditators are phase conjugate !, *almost exact duration of Earth AND Venus orbital years, - the list goes on ... (dodeca /icosa conjugate geometry of d,f electron shell noble gases and platinum group metals- physics of alchemic implosive charge collapse- new science of transmutation..). These are all the structures which produce life and negentropy! They fit the pattern far too well- for this to be arbitrary. 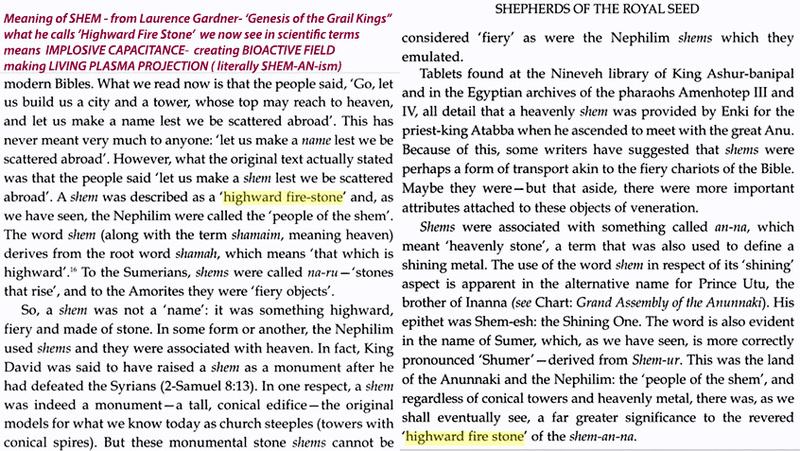 translation underway scheduled to be released on Implosion Groups: spanish, french, german, and italian web sites. The classic mathematics of what a mathematic fractal is (right: serpinski triangle and 'fractal tree')- pale in comparison to the deep physics Dan Winter has shown for 3D fractal WAVE structure in his equations for the structure of hydrogen, and all fractal negentropic living/ gravity making PHASE CONJUGATION- which he shows with his copyrighted animations here (3- 1 above- 2 below) - of this true HOLY GRAIL of physics- in his book FRACTAL SPACETIME. 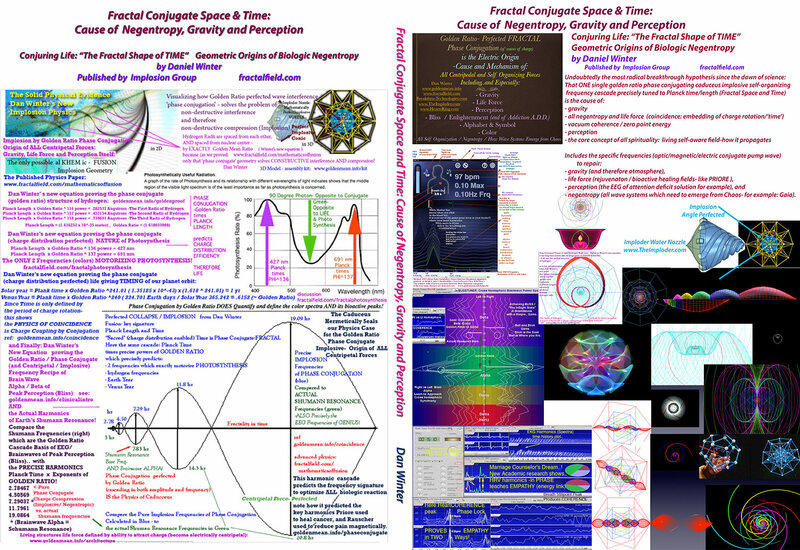 AND- to wit- Prime Example- Restoring Biologic Negentropy- Prime Example-USING THE PRINCIPLE: Fractal Plasma Time Reversal Field Tech- Prototype soon Ready! 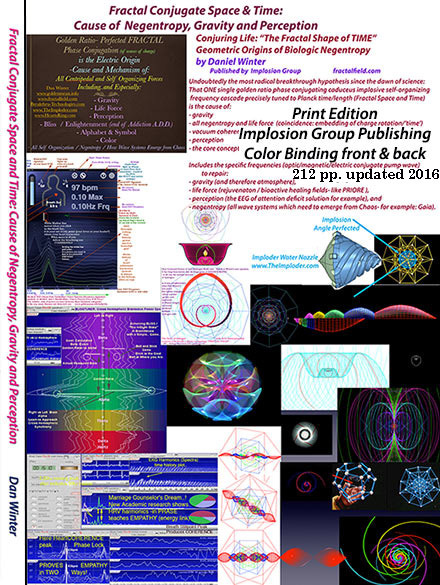 Implosion Group Australia team - is preparing to release WITH this new book.. PRIORE.. Their latest functioning prototype: The Priore Plasma Field was documented by the French Government- for curing thousands of serious diseases and cancer: (pdfs: fractalfield.com ) Dan Winter's equations now explain the pure phase conjugate principle behind Priore- and our partners are completing the very exciting prototype (see picture): Actual biologic living plasma induced time reversal field technology! 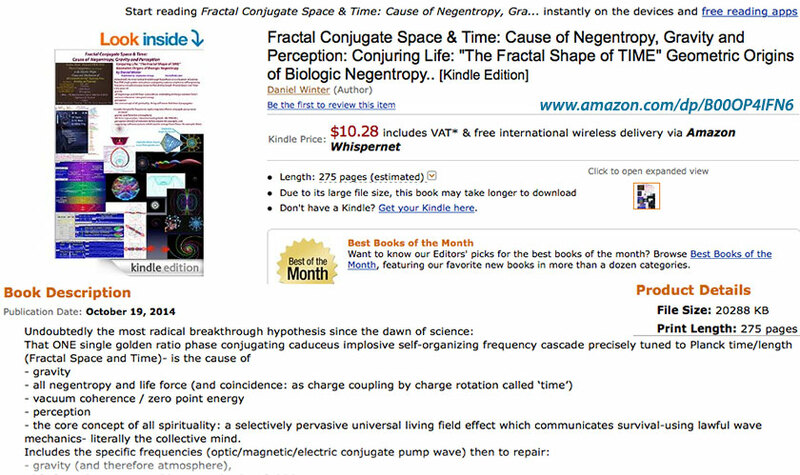 Plasma conjugate light and magnetics- all based precisely on the frequencies and phase conjugate technology described in FRACTAL SPACE TIME!